On Friday, a hilarious video of Tom Tobey and Christopher Atkins introducing new Meatbeast mounts and house pets was released. The video was extremely well-received and I and many others ran out to buy the new mounts and pets and galloped all over Norrath mooing all the way. But today, it seems the EQ2 team may have pushed the April Fools joke too far. As was announced on Friday, a pink version of the Meatbeast matriarch mount is available TODAY ONLY (April 1st). What has players stunned is the price: 5,000SC. If you stocked up on StationCash over the weekend from Walmart, that works out to $18.75. If you didn’t, you’re going to be dropping upwards of $50. That’s more than an expansion! Further, players couldn’t help notice that the original price is marked as 50,000SC 5,000SC. Players are not seeing the humor in that price markdown and instead wondering if the mount will jump to that price the next time it’s offered. We’ve heard from a few players who were so excited to purchase this mount that they grabbed one without double-checking the price, and are now out 5k SC. Thus far, EQ2 mounts have hovered between 1,950SC and 950SC. Further, players have expressed shock that it’s not a Leaping mount, nor does it offer any bonuses to runspeed, beyond other mounts. You’re literally paying for a re-color of the Bovoch mount added on Friday. Raph Koster wrote an article which has been heavily quoted on MMO sites about Free-to-Play and the existence of Whales or customers who will buy big ticket items on game marketplaces. Is this SOE’s first foray into this category of high dollar items? Are they seeing a marketplace trend and simply getting on board with having a few rare items which are at a price beyond what most players would consider a sane purchase? 5k SC for a Mount. Seriously? SOE snatches defeat from the jaws of victory. The New 2013 Honda Accord Sedan. Starting price $21,680. Available in Alabaster Silver Metallic, Modern Steel Metallic, or for $55,000 – Pink. That pricing is absurd. If you double the price of the original ones, you’re still 1100 SC short. Really unhappy with SOE right now. Not taking a ‘disagreeing for the sake of’ stand point but isn’t this the phenomena of turning something pink? It’s all the female crafting community want; pink pink and more pink. Complain all you want but you and I both know that somewhere, right now, a craft-holic house decrating she-beast is traversing norrath in a 5k SC mount AND loving every second of it. Is it ridiculous? sure! The price matches the inanity of the product and the people who purchase them. But what the hell do i know, i can’t bring myself to buy a super badass flying squirrel for a ‘mere’ 2k SC 🙁 ir2jew. tl;dr put a ‘swoosh’ on any tshirt, gratz 30$ tshirt. SOE had a Double StationCash weekend. SOE told people this pink version of the Bovoch would be available Monday AFTER DOUBLE SC HAS ENDED. Not surprisingly, people went out and bought SC specifically to buy the pink Bovoch for what they thought would be 1950SC. Then BAM it’s Monday and the mount is 5,000SC. Remember, you don’t buy StationCash items. You buy StationCash. THEN you buy items. Hundreds of people ALREADY spent the money on something that is now more than TWICE the price they were originally expecting to spend. How many people who want to buy it now need to spend another 3,000SC at *normal* price to make up the difference? It’s way too late for “if you don’t want it, don’t buy it” because SOE already got the money. @Le Clown — I don’t recall exactly where, but I recently read about a game where there was a cosmetic hat where pink was the rarest of the rare colors for it, so those hats were worth tons of its in-game currency. An exploit was found which enabled these pink hats to be duplicated. Even in spite of this, they never really lost their value for some reason. I can’t help but wonder if all the “pink” stuff lately isn’t a nod back to that game. If you dont like the price, dont buy one. If you bought one without looking at the price first… that was stupid. Grats on the life lesson. Personally, I think its a pretty damn hilarious April Fools prank. I think the analogy of the swoosh is valid here. There are no name brands in Norrath per se, but the idea is the same. They can charge whatever they want for their merchandise… if they think people will be willing to pay 3x the average price if they add a swoosh, or a gucci label, or a pink reskin, then they have every right to charge what they want. This is the saddest part. Seeing all the enthusiasm this event generated just trickle away for no reason that I can think of. The team went above and beyond on this and I fear that will get lost in a pricing decision not even made by them. Consider it the “cash casual” equivalent of end game raid gear. It gives people an opportunity to flex their SC purchasing skills and show off the rare item that the high price is sure to make it. I wouldn’t be surprised if several heavily platted up raiders paid plat for SC and picked one of these up, too. Well, I won’t lie, I’m one of the *idiots* who got one. I have had a long and vocal commitment to Meatbeast. My appreciation for what they gave me over the weekend between mounts and pets and warders made me willing to spend my double and triple SC and the free SC they give me each month to make my collection complete. I went down the road to a local farmer and rode his cow for $5. Take that Sony! SOE trying their own version of cow clicker? cow now comes in pink for more than twice the price. You would think with all the talk about how greedy they are they would know better than to touch the subject of pricing as an April fools joke. Personally this ranks up there with one of the lamest April 1st jokes. Only topped by a former coworker who thought it would be funny to mass email he was dying of cancer. His manager didn’t think it was so amusing (the managers sister was battling breast cancer at the time). Needless to say he didn’t last much longer at the company. I’d like to twitter something but I don’t have enough followers so I’ll do it here. Do not like the price? Well then do not buy the item, pretty simple there. Everyone expected it to be 1,950SC. Only AFTER people had bought the StationCash did they find out the price was jacked to 5,000SC. SOE doesn’t get paid when you buy items. They get paid when you buy SC. I can’t really tell from the screenshot… is that the rider’s hand or does the mount have a too-cute pink bow on its head? Anyway it would have been funnier if they’d mailed everybody one for free and it was temporary item (today only). Servers would have been full of herds of them! People that bought SC over the weekend still got their SC for half price. They still got a bargain. Its not like there will never be anything they want to spend it on. If you’re willing to spend 1950 on a pink cow beast, I can pretty much guarantee you will want to spend 1950sc on semething else down the road. Wait for that something, and then instead of spending MORE money you’ll already have the SC. I just wanna know who thinks a micro-transition is $50????!!!! I would not pay $50 for any marketplace item or even $20 not “micro-transitions” in my eyes. Micro-transition should NEVER be more than a monthly sub. Period! I personally feel that NOTHING on the marketplace should be more than $10 max. Gash: Your opinion is duly noted. And at least by me, it’s noted as completely bovoch dung. For years, many people have thought that 1920 SC was too much to pay for a mount. But then they announced the pink bovoch and implied that it would be available the day after a double station cash weekend for 1950 SC. Many people finally caved and bought enough SC over the weekend to buy a 1950 SC mount. That’s important. They bought the SC over the weekend for the sole purpose of buying the pink bovoch mount. Then they released the mount for more than double the amount of any previous mount. AFTER people had already bought the SC. You make the assumption that just because someone bought SC to buy the pink bovoch mount, they obviously will want to buy something else later. Think of this. Lets say they told us that the next expansion would be available for SC. Then they gave us a 2x or 3x deal on SC. Then the expansion came out but cost 300,000 SC. Forget the fact that you can buy it for $39.99 cash. Sure you can get it for SC and sure you purchased SC specifically to buy the expansion, but it turns out, the way things work changed. Eh, so what, something else will come along down the road that they’ll want to spend the SC on, right? This is crazy, but really i expect that EQN will be a F2P Based Business Model without Monthly fee and just only an SC market, where you have to buy everything. This is just a proof for that, see it as beta testing for EQN. I personally don’t care about SC mounts, certainly not pink ones. However, this kind of situation bugs me, because it harms the game I play. SOE could have avoided 95% of the commentary and outrage if they were to have just said the pink meatbeast would cost extra ahead of time and offered double SC through Monday. Seriously, they should fire their entire PR staff, starting with the stupid dwarf, because they still haven’t figured out that negative surprises are the best way to lose customers. Isn’t it obvious? This is their cash cow. Premium mount for premium price – nothing wrong with it. 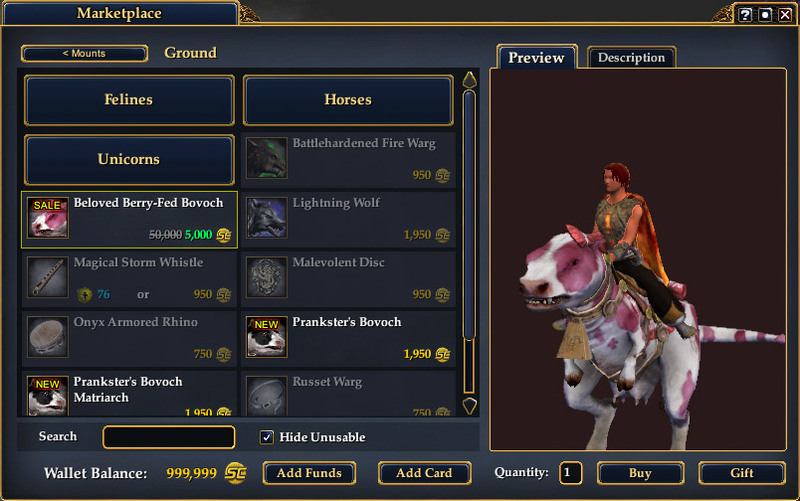 Reminds me $50 LotRO hobby horse. I agree, I think it would have gone done alot better if people would have known from the get-go. ALot of people spent all weekend getting excited asbout Monday for what turned out to be no real good reason. I would hope Sony will be refunding the money of anyone who actually dropped $50 into a friggin mount. I like a good prank as much as the next person, but when it involves money, there is a thin line between what’s legal and what’s not. This seems like another case of EQ2 players making a mountain out of a mole hill. Yes, 5000SC is obscene for a mount. Hell, 1920SC is obscene to spend on something that’s essentially a cosmetic item. But, as it has been pointed out, the fact that people can’t be bothered to look at the price of an item isn’t SOE’s fault. Plus, it was April Fool’s. Expect shenanigans. Get mad about broken game mechanics and encounters instead. This is being made into a far bigger deal than need be. A ‘fluff’ item can be just as important to people as statted stuff. It is all about how you play the game. That is one thing I love about EQ2 – there isn’t only one way to play, one way to get pleasure from it. Like house items – many hate that – decorating etc, others love it passionately. Many of us like to roleplay or semi-roleplay our toons, we like making them look good, or different, or unique. Having a cool pink meatbeast mount is just as important and pleasurable to some people as spending weeks raiding in order to earn enough points to roll on some helmet is to others. And there is nothing wrong wrong with that. When it comes to a SC item, its simply a directly financial commitment rather than (to use the example of raiding again) a time commitment. It is the devious way that SOE got everyone excited, offered double SC, offer ended, mount appears costing over twice as much as expected, people had to either buy more SC at FULL PRICE or not get mount and have spent money that they wouldn’t have spent if they had known the mount price in advance. Yes, the player could not buy the over priced mount, but SOE has got their money already for the SC they bought in order to buy it and a reasonably expected price. It is unfair to criticise those who wanted this mount for being disappointed and angry over something so pointless. It isn’t pointless to THEM and how they get pleasure from the game. Personally I find raiding to be the dullest activity invented, but I don’t begrudge raiders their issues, problems and priorities with the game. Mine just differ. This game is about everyone, and everyone has different play styles and pleasures. None are right, none are wrong and none are ‘stupid’. SOE is the one who deserves criticism here, not the players who wanted a pink cow. I don’t see double or triple SC as a responsibility of SOE. You take issue with double ending before but imo giving double before only led to more ppl buying discounted SC. The customer won. unless you think players are ENTITLED to discounted SC every time they buy. I think stating price in advance or hinting it would be excessive would have gone a long way with playerbase, but that would have taken some of the surprise out of it. its a 1day event. this probably was hatched in the evil brain of a marketing guy. tease with double sc->players buy discounted thinking it will be normal price->release 5k price->players are already invested in the purchase since they bought sc during double promo->player buys more sc to complete their goal they have already invested in by buying more sc to purchase the mount. this is pretty basic stuff of how to bilk and haggle. used car salesman make this an artform. Does anyone out there have legal experience with ‘deceptive marketing’ laws? If so, it’s time to give SOE a b!+*#-slap they will never forget. I find it way over priced. Your typical greedy $€£. Yay for marketplace costing less heh? And for the record, before someone points it out, the disco on Storms was made by my woodworker on hubby’s account. Used up SC bought more than a year ago on a triple SC day with months of 500SC dropping in. As none of us still actually plays any more, it was just a way to clean up the SC balance a bit. Just another shining example on why SoE is cash hog. Sadly, it’s a brilliant move by SoE to get ez money. Most hilarious comment of the day ! @Pipsissiwa – Well stated!!! Thank you! Asides, I think SOE would have more people purchasing SC to purchase said mount and get more sales. Aside from already-purchased SC. My $€£ image was removed for trolling on the boards ;p No surprise there, it did stick around for several hours and I never expected it to be bypassed by the mods. @Whilhelmina – That image was funny, very clever indeed. BUT – How is the revenues derived from SC distributed amongst each property? One would hope each game would get the cash value of the SC sales they directly generate. But then they announced the pink bovoch and implied that it would be available the day after a double station cash weekend for 1950 SC. I don’t understand how the omission of the price can be considered to be implying a price. Even if they drop the price to normal levels, I still think a rebate is in order for anyone who actually bought it for 5k, let alone anyone who may have bought it for 50k. Even if there are 2 different teams working on SC and the store, both had to know what each other was doing. Then again we’re talking about SOE, who for as long as I’ve known them, has always suffered from the “too many cooks in the kitchen” syndrome. When people come to SOE’s defense with “They gotta make money somehow”, my reaction is: SOE don’t have any problems making money. They make more than most of us combined with or without us. Everyone needs money, so it’s no excuse. But like Pink said, it appears several games already resort to having their majorly overpriced item that only a handful of people felt it was worth buying. As long as those people are buying them, the designers will keep selling them. Didn’t SOE say this once about gold farmers? Oh the Irony. That’s never been the case. Even with subscriptions, the money that could’ve gone into development and expansion went to other projects. Listen to some of the old podcasts when the producers were actually involved, EQ2 sounded like the old warhorse all new hires were put on before moving on to the good stuff. My God, people will find the dumbest crap to complain about. SOE are no angels, but people will jump on any bandwagon just to rag on them these days. So freaking what if it’s a premium item – it clearly stated how much it costs. There was no deception here. If people assumed it would be less than 2k, well then you learned a valuable lesson about assumptions. LOL. I quit playing for a while due to being annoyed with various things (Proseiben, losing suburb homes, assorted irritations). Then just came back to show houses to someone visiting and thought hmmm…maybe I will play some more. Now this reminds me of why I left irritated before. So… it wasn’t an April fools joke?